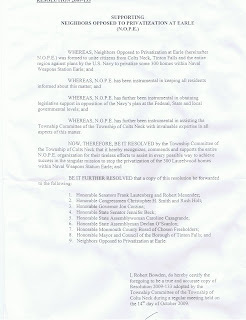 In a mild oversight, we neglected to post Resolution 2009-133, adopted by Colts Neck Township Committee and signed by Administrator Robert Bowden on October 14, supporting Neighbors Opposed to Privatization at Earle. NOPE clearly appreciates the support of Township Committee and their submission to U.S. Senators Menendez and Lautenberg, Congressmen Smith and Holt, Governor Corzine, the District 12 State team, the Monmouth County Freeholders, and Tinton Falls' Borough Council and Mayor. Pardon the cutoff of Mr. Bowden's signature, but until this document is electronic posted to Colts Neck's website, the attached photo scan will do (just click on it to open). Remember to attend our rally next Tuesday, October 27, 2009 at 730p - Colts Neck High. Please, please do not put our children at risk by letting civilians live on the base at Naval Weapons Station Earle! !